Bergen's funicular, the Floibanen, hauls tourists from the city center to the top of Mount Floyen. The fantastic views of the city and suburbs from on high are the main draw. But a short hike on the trails leading away from the viewing plaza revealed how easy it is for residents of Bergen to take a break from the city. 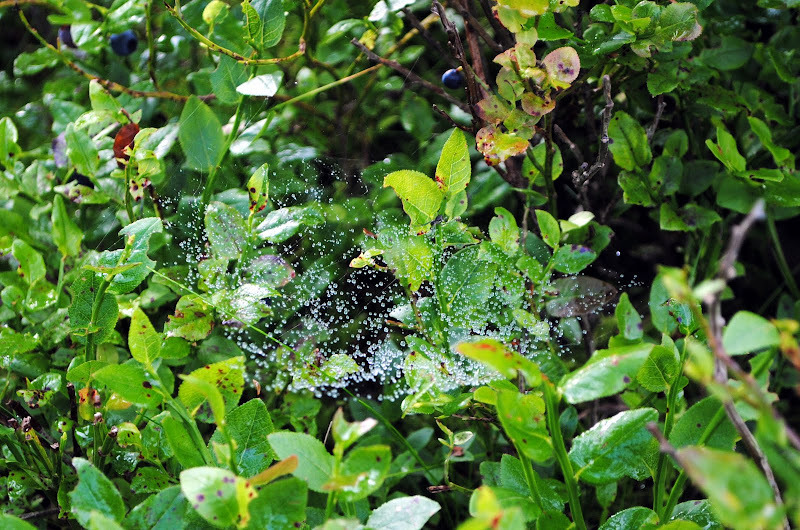 Around tiny Skomakerdiket lake, we noticed a profusion of blueberry bushes, grasses, and other low and lush vegetation, mainly because they housed tiny sheet webs, like the ones above and below, which had preserved that morning's drizzle in two different ways. These are probably linyphiid webs. Being an expert composter whose decomposition wizardry unfortunately extends to nearly any live plant I attempt to nurture, I've never been much of a gardener and consequently am pretty botanically ignorant. I'm finding that webs are pulling me into a greater appreciation of undergrowth and of the vast variety of small plants that grow even in places that initially seem bleak. 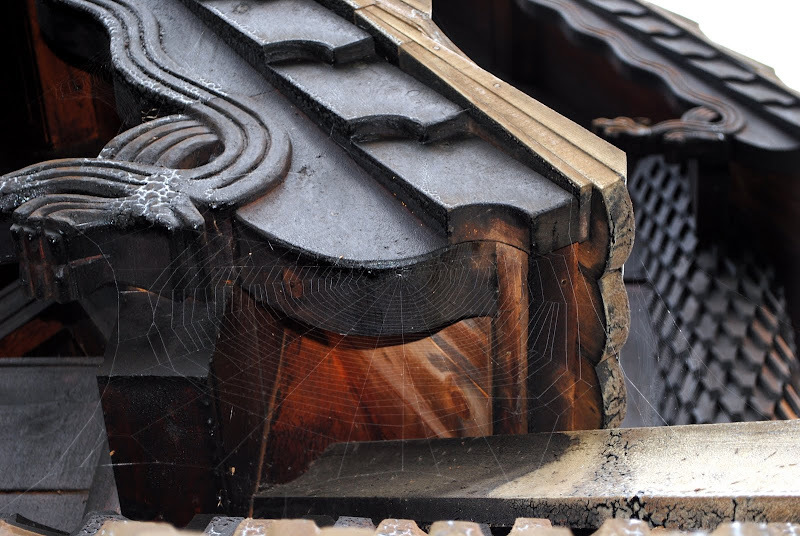 Norway is famous for its remarkable and beautiful stave churches, and orb webs draped every one we visited. Here's a section of Fantoft stave church, which was rebuilt after a fire destroyed the original in 1992. Dramatic, undulating woodcarvings are the most salient exterior feature on these churches. But looking at the webs also focused my attention on the immense amount of joinery involved in these buildings, on the fantastically huge number of times pieces of wood had to be fitted and then fastened to one or more others. For example, look at the lapped pieces of wood where an ordinary clapboard house would have a rakeboard. Dragon heads are liberally distributed about the building, but this lapping of thousands of small pieces of wood and the alligatoring of the tar used to preserve the church's exterior made the entire building slightly reptilian. 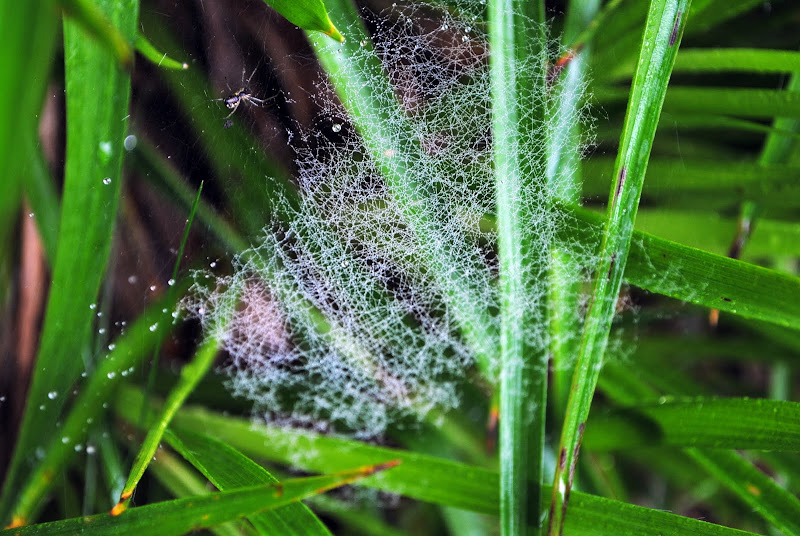 Unless the weavers of these funnel webs, probably members of the family Agelenidae, ballooned in from elsewhere (certainly possible), their nth-degree great-grandparents' webs were frequently rattled by the piano pounding of Edvard Grieg. Here's the exterior of a window at Troldhaugen, Grieg's summer home on the outskirts of Bergen. Staring at the webs on this window frame and others made me wonder about the evolution of window architecture in Norway vs. the US. 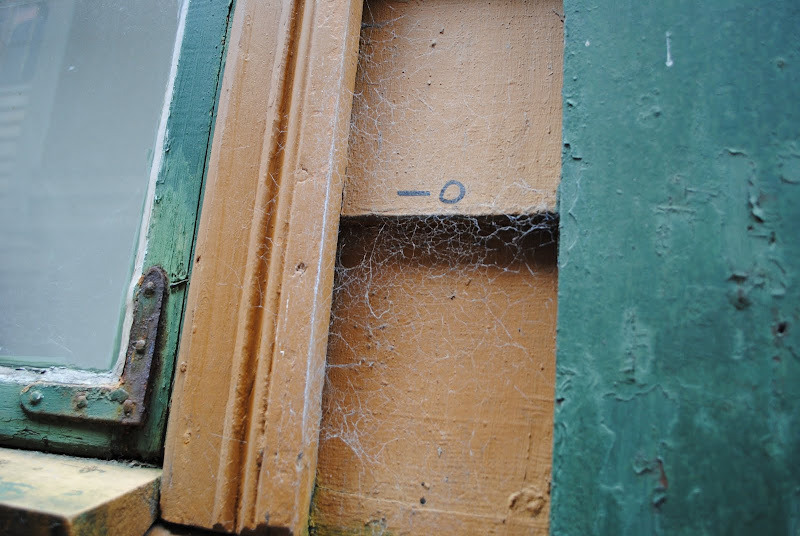 This is the corner of a window we spotted along an alleyway in the Bryggen, flanked by a meshweb probably woven by a member of the family Dictynidae. In Norway, most windows we saw were, like these two, casement windows, as opposed to the sash windows found in most houses of this vintage in the US. 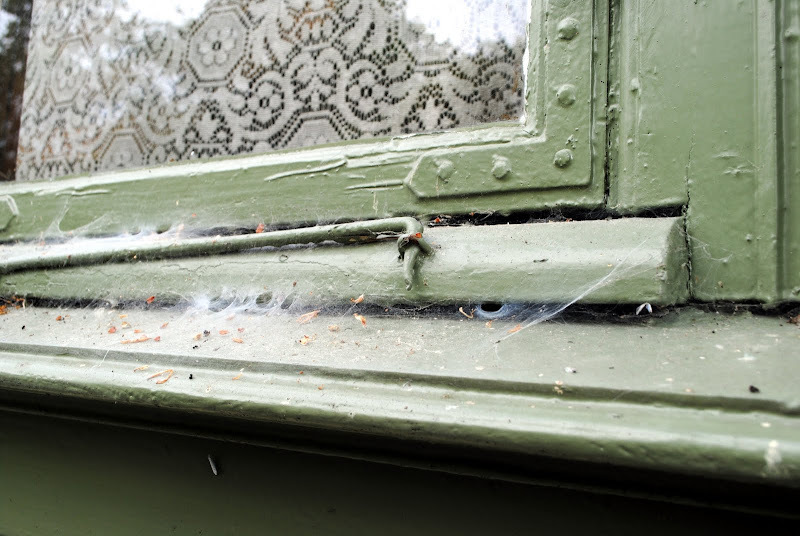 In some ways, sash windows (probably invented in England in the 1600s) are a technological advance over casement windows, which were the standard before sash windows. But both types of window effectively let in light and air, so builders in different places still use both in modern houses. It's like web evolution: These pre-orb funnel and mesh webs serve their makers just fine, so they haven't been superseded by orb webs. For a beautiful catalog of Norwegian spiders, check out Glenn Halvor Morka's Edderkoppkroken site. ("Edderkopp" is Norwegian for "spider," and shares an ancestor noun with "attercop," the old English word for "spider," which Paul Selden and colleagues preserved when inventing the genus name Attercopus for the fossil originally thought to be the oldest fossil spider ever found.) Never underestimate the influence of the Vikings. Beautiful prose and photos. Fascinating. I can imagine an exhibit of photos of different places "from a spider's perspective." Interesting to see Norway at close range but I'm still interested in a few fjord and cityscape shots. What a great trip. Hope to see you soon.